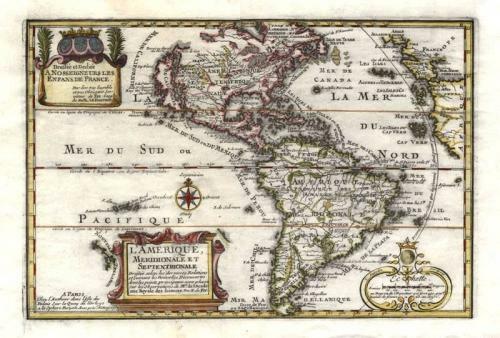 A French map of the American hemisphere by Nicolas De Fer. De Fer is a popular cartographer on account of his dramatic and decorative style - and his geographical errors. This map is a perfect example. The map extends to New Zealand and to the African and European Atlantic coasts. California is shown as an island. Three cartouches and a compass rose embellish the map. The map is in very good condition with bright colours and strong paper. There is some light foxing in part of the top margin that does not enter the image area.